Causes of Low dissolved oxygen in fish pond water and how to improve it. Dissolved oxygen is an important water quality parameter in fish farming. Just like terrestrial animals and plants, fishes and aquatic plants(like planktons and algae) requires oxygen and this oxygen is available in dissolved form hence it is referred to as ''dissolved oxygen''. fish take in in oxygen through their gills for growth and development. Generally, catfish could tolerate dissolved oxygen content of 4mg/l in pond water because it could absorb some amount of atmospheric oxygen. 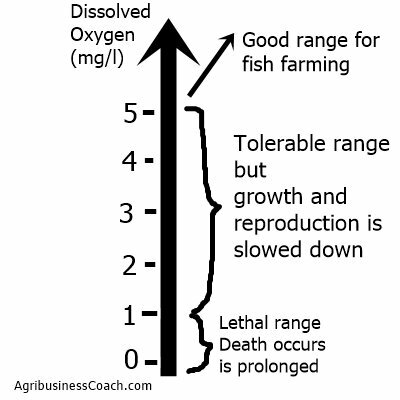 Tilapia requires an optimum dissolved oxygen content of 5mg/l anything less than that leads to death. Atmospheric aeration of water by wave, wind and other water mixing action. decomposition of organic particles as a result of too many organic particles from fish waste, over uneaten feeds in the pond water. respiration by aquatic plants: Although planktons and algae add oxygen to pond water during photosynthesis, they also remove oxygen during respiration. Hence, excessive aquatic plants will deplete dissolved oxygen. How to know when the dissolved oxygen level of the fish pond water is low. Fishes gathering at the surface of the water and gasping for air and swimming lazily. The water looks muddy and very turbid. How to improve or correct low dissolved oxygen in the water. Flushing the pond water to remove excess organic and inorganic particles as well as excess planktons and algae that exact excessive demand for dissolved oxygen and also reduce light penetration. Mechanical aeration of water using an air pumping device (aerators) for large ponds. Mechanical aeration is also used in hatcheries to ensure the delicate fries have adequate oxygen for survival. Integration of ducks to fish ponds to assist in aeration of pond water. 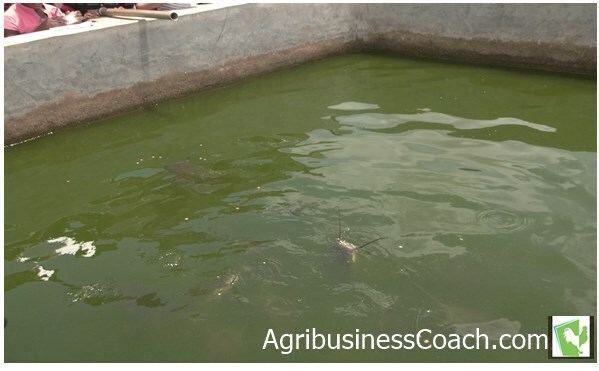 This is usually used for earthen ponds in the semi-intensive and extensive system of fish farming. Do you have any questions? I would like to hear from you. Please comment using the comment box below.